Wait, that was a lie. I only got one request for muffins and it was from my daughter. And really, that was kind of a lie too because the way it went was it was 5:00 PM and she was starving. I said “Hey, how about I make you some muffins? !” Because really, I just like making muffins and I figured if she was hungry, this would be a good time for me to test out these semi-healthy bran muffins made with yogurt. The end result was a clean plate and compliment which included “Thanks for not putting anything in them, Mama.” because I’d left out the fruit and nuts which she hates, but which you might want to add back in if you or your kids need more than a less homogeneous texture. Served plain, these are lighter than the usual bran muffins, just sweet enough to please a sweet tooth, and made with unprocessed bran which is never a bad thing. I wish I’d used white whole wheat flour too, but I have to go stock up on that today. Preheat oven to 375 degrees F. Grease 10 muffin cups or line with paper liners. Add the flour mixture to the sugar mixture alternately with yogurt — don’t over-mix. Fill muffin cups and bake on center rack for 25-30 minutes. Adapted From this fine recipe on Recipezaar. Just noticed I called for “1 eggs” and spelled muffin “mufin”. Corrections made! Thanks everyone for not pointing out typos. Anna, These are delicious! I swapped out a few ingredients…used 1/2 cup whole wheat flour and 1/2 cup whole wheat pastry flour instead of all-purpose. I cut the brown sugar in half, using 1/4 cup, and added some nutmeg. And I used applesauce instead of oil. I added about 1/3 cup of ground flaxseed to the brown sugar, oil (or in my case, applesauce), egg mixture. They were fluffy and so tasty. 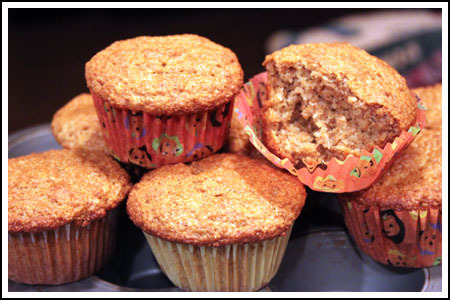 I make muffins ALL the time…these are going into the rotation! Thanks for another great recipe! I’m always on the lookout for new muffin recipes. I love the fruity ones, but like your daughter, I dislike nuts in mine. This one looks very tasty…and healthy! I was inspired by your muffins and the fact that the thing that kept falling out of my overstuffed freezer when I’d open it was a big ol’ bag of bran. So I added 2 T. cocoa powder, 1/4 teaspoon ginger, about 1/4 cup chopped candied ginger and 1/4 cup mini cc’s. Smells good. Thanks Suzy! I really appreciate your comment :). Muffin Mania continues. LOL I just checked. Muffin Madness is already taken and being used, but Muffin Madness Dot Net is available according to whois. The muffins look great, but I think I’ll try them with blueberries or cranberries. A lie that turned out to be yummy ! Bran in the muffins sound healthy. Shall give a try. You are too funny, Miss Anna of Muffin Madness! And the cinnamon in the bran muffins sounds good. They don’t usually have any spices that I recall. I made some bran muffins last week that had just a couple tablespoons of cocoa (gotta have my chcolate) and they were actually really good. I think I used buttermilk. I packed them babies full of just about everything but the kitchen sink, including some candied orange peels I made as well as a few chocolate chips, some nuts and dried cherries. I really liked them. I wish my kids would eat a bran muffin! Maybe I’ll try them more plain than with all the stuff I put inside, love the cinnamon idea, as well as other spices.